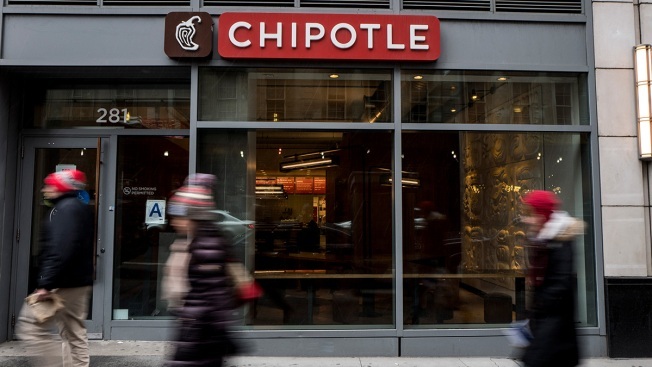 People walk past a Chipotle restaurant on Broadway in Lower Manhattan on February 8, 2016, in New York City. When it comes to food, more Americans are looking for convenience over quality these days. NBC News reports that satisfaction with full-service restaurants has reached its lowest point in 10 years, according to a report on Tuesday from the American Customer Satisfaction Index. The survey of 5,500 Americans also found that fast food restaurants rated higher than full-service restaurants in customer satisfaction ratings. Fast food restaurants, referred to as "limited-service," includes traditional chains, like Burger King, along with fast-casual restaurants, such as Chipotle and Panera Bread. Chick-fil-A earned the top-rated restaurant chain spot among limited-service establishments in the survey with a score of 87 out of 100 points. Cracker Barrel won among full-service restaurants with a score of 84. Potential reasons for the decrease in satisfaction with full-service restaurants could be higher menu prices, increasing competition and lower grocery prices that have encouraged people to cook at home.